The OM-PR Series pressure/temperature data loggers are battery powered stand alone water tight compact data loggers that record up to 64,000 samples of pressure and/or temperature data. These data loggers can be configured to record pressure and temperature or a parameter alone to maximize data storage space. The unit is easily configured using the included Windows® software. Simply connect a standard USB cable to the logger and an open USB port on your PC and the Windows software automatically identifies the data logger. Configure the unit to start and stop recording at a predetermined time and date or only when an alarm condition is sensed. The sample storage rate can be set from 1 sample every 2 seconds up to 1 sample every 24 hours. The on board data storage is non-volatile so data will not be lost in the event of a depleted battery. The OM-PR Series pressure/temperature data loggers are available in several pressure (0 to 35, 0 to 150, 0 to 350, 0 to 550, 0 to 2000, 0 to 5800 psia) and vacuum (760 and 380 Torr) ranges. 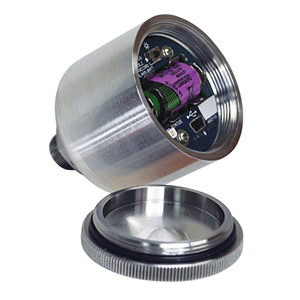 The data logger is packaged in a rugged submersible 316L stainless steel housing and has a standard ¼ NPT fitting. The replaceable internal lithium battery has up to a 5 year life. The Windows software is a powerful data acquisition package and is included with every OM-PR Series data logger. It allows for easy setup, retrieval, interpretation and export of the recorded data. Simply connect your data logger to an open USB port and begin communicating immediately. Choose absolute or gauge readings, as well as your pressure scale from a list that includes kPA, MPA, Bar, milliBar, mmHG, Atm, PSI, pascal, inH2O and torr. Record the average, instantaneous, maximum, or minimum pressure during your sample interval. Point and click to select your sample interval, alarm set points, engineering units and recording triggers. View a numerical data table or graphical representation of data readings relative to time. Use the graph tools such as zoom, cursor, min and max to examine and analyze the record. The Windows software turns your PC into a real time data acquisition system by allowing you to stream graphical or tabular data directly to your PC. Stored data can be exported into an Excel spreadsheet.